I may have grown up in California, but I've learned more about Mexican food working is a pseudo French restaurant in Seattle than anywhere else. You see, kind readers, one of the owners of the restaurant is half Mexican and she has a lovely spell over the guys in the kitchen. They make Chile Reillenos, insanely good egg dishes with fresh salsa, and (Heaven on Earth) Ceviche. 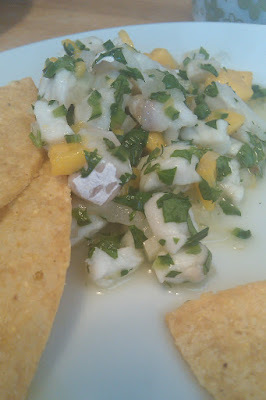 Ling Cod Ceviche with mango, poblano pepper, onion, and cilantro, served with tostadas. I learned to love and really appreciate Ceviche at this restaurant. If you're not familiar with the Ceviche, it's the acid-'cooked' fish dish that'll bring any real fish lover to there knees. No kidding. When the season is right, and the fish is fresh, there is nothing, and I mean nothing that tastes more sweet, savory, tart, tangy, and superbly fresh as Ceviche. I tried my hand at making it the other night because, well, I needed something fresh and springy; it's still only 47º in Seattle and it's this time of year that Seattleites are forced to substitute sunshine in their food due to the lack of said orb in the sky. 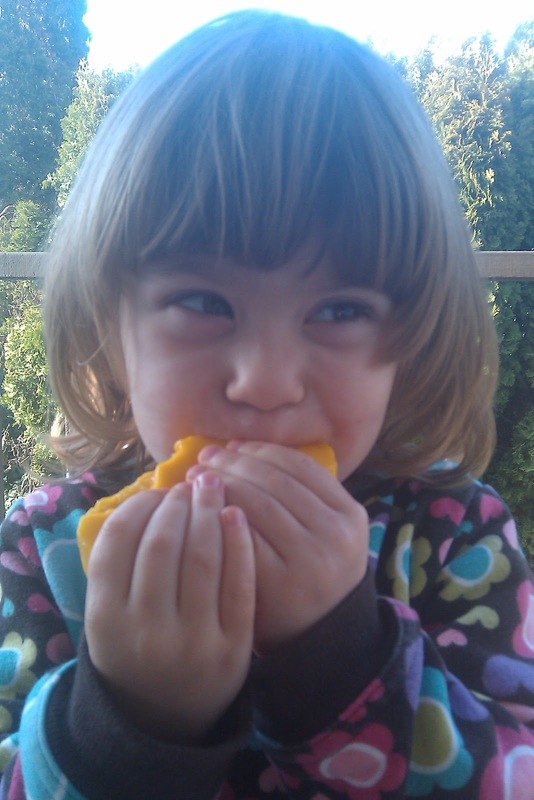 I knew Lorelei would eat it (it's fish served with crunchy things, after all). So I went to my fish monger and asked what the freshest and cheapest fish was that day. The Ling Cod looked the best. 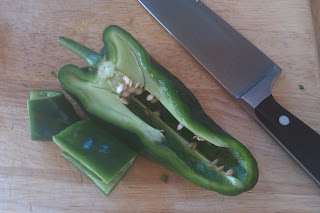 I grabbed a half of a pound and headed on home with that and the rest of my fresh ingredients and had at it. 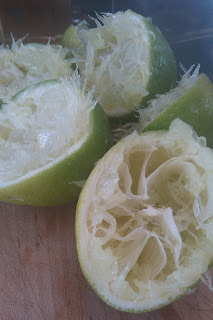 1) Juice the limes: I learned a trick from my boss. 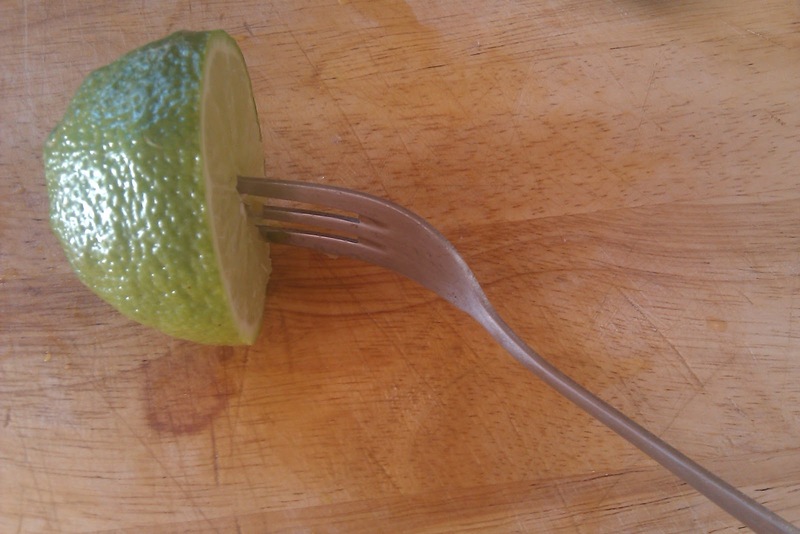 The best way to get all you can out of a lime it to ream it with a fork. Insert a fork into the center of the pith when, while firmly squeezing the lime in one hand, make a rocking motion with your two hands. There will be nothing left to give after you're done. 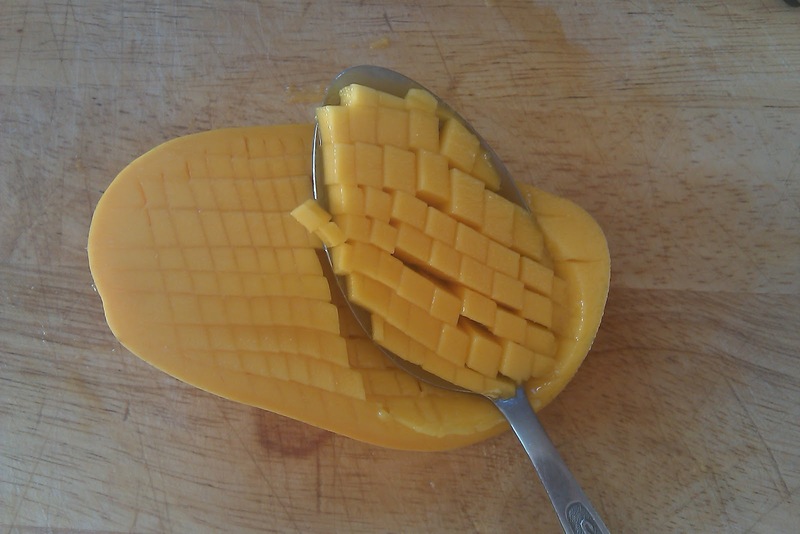 TIP: Here's a tip on how to cut a mango. 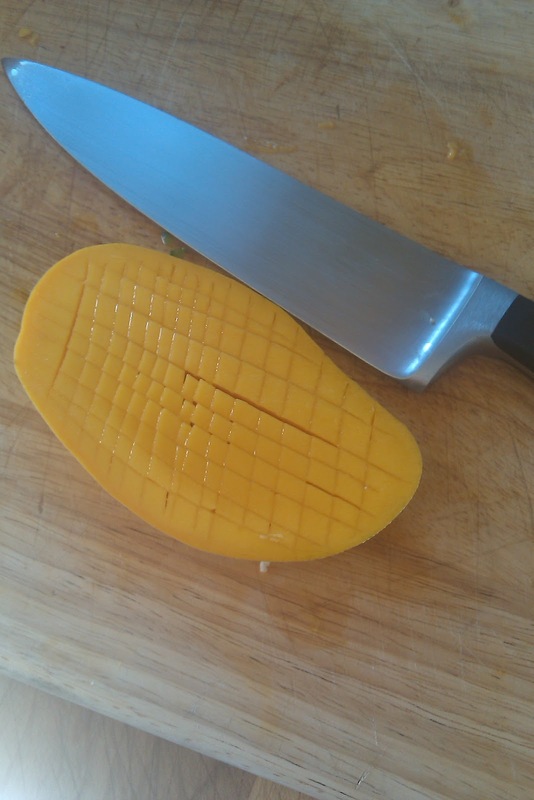 Mangoes are slippery little beasts. 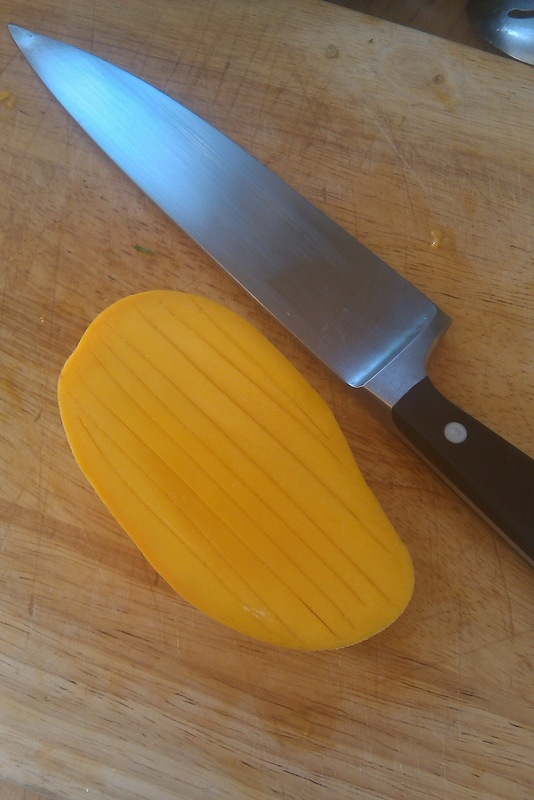 The easiest way that I've found to cut it into small pieces is to score the flesh with the tip of a knife while it's still in the skin then scoop it out with a large spoon. 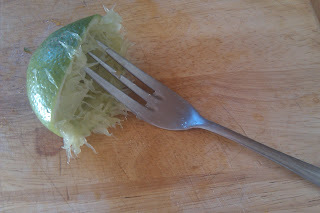 The same can be done with avocados, a similarly slippery fruit. TIP: For cutting your pepper, slice it in half, pull out the seeds and white bibs, then turn it cut-side down and flatten it. 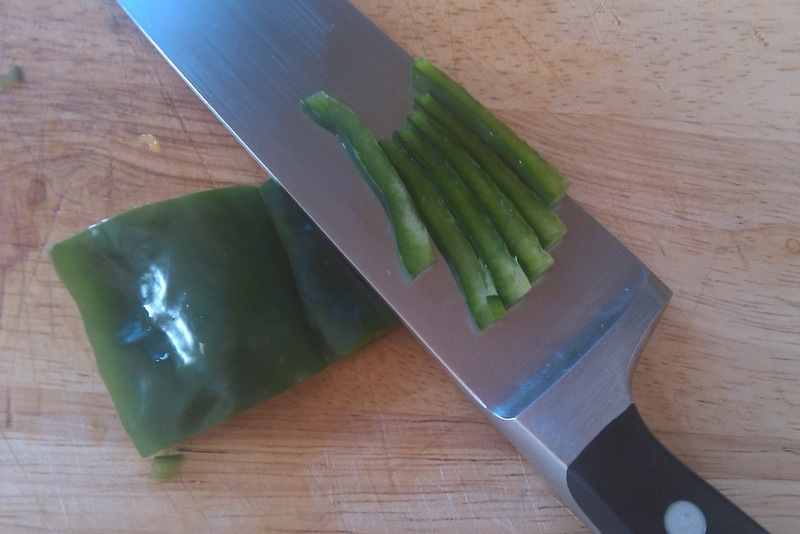 This will allow you to easily slice even strips and not chase the damn thing around your cutting board. 4) Coarsely chop your cilantro, and set aside. When your fish is opaque through the center of the pieces, add the rest of the ingredients and a dash of salt. Serve in a bowl with tostadas or tortilla chips and enjoy. You may be wondering if Lorelei liked it. Not only did she like the Ceviche, she really dug the mango pit. Definitely a hit!! Let your kiddo scrape the rest of the mango flesh from the pit. It's a messy, wonderful, and healthy treat... outside! *Here's a great Washington Post article on the chemistry behind preparing/cooking fish with acid.